The publication of Josh Alan Friedman’s new memoir Black Cracker this week reminded me of some things he recently told me about the pioneering black artist Alvin C. Hollingsworth. In the early 1960s, Josh was the only white kid in the last segregated school in New York City. 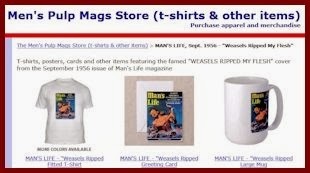 Josh’s father, Bruce Jay Friedman, edited Men, Man's World and other men’s adventure magazines for Martin Goodman’s Magazine Management company. Because of his dad’s job, Josh got to meet some of the writers and artists who sold stories, artwork and cartoons to men’s pulp mags in their heyday. One of those artists was Alvin C. Hollingsworth, a.k.a. Al or A.C. Hollingsworth. He was also sometimes known by his cartoon pen name, Alvin Holly. Hollingsworth was one of the first African American artists to break into the comics and magazine cartoon business. 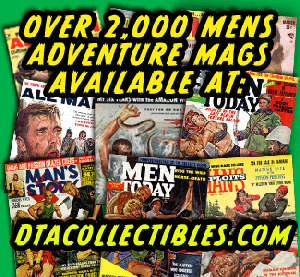 Among his markets were the men’s adventure magazines that Josh Alan Friedman’s father edited. “I remember Al very well,” Josh told me in a recent phone call. “I was the ‘Black Cracker,’ the only white kid at my school. Al was also a very good painter, who eventually had his paintings shown in galleries and museums. I remember that he came over for dinner a few times to our house and he would always bring my dad one of his new paintings. I also remember Al was a bodybuilder. Huge arms. He was a heavy weightlifter. In fact, a lot of the artists who did artwork for the Magazine Management magazines were bodybuilders. Mort Kunstler, James Bama, almost all of them. Unlike Kunstler and Bama, who provided painted cover art and illustrations to men’s magazines, Al Hollingsworth sold them line drawings and “Good Girl Art” cartoons. But he is probably better known for his comic book art. Along with Matt Baker, Hollingsworth was one of the most prominent African-American comic book artists of “Golden Age” and early “Silver Age” comics. Starting in 1948, when he was only 20, Hollingsworth worked off and on with the legendary Joe Simon and Jack Kirby studio. In the 1950s, he penciled and provided stories for adventure and horror comics published by Avon, Key, Trojan and Comic Media. By the late 1960s, Hollingsworth had pretty much left the comics and men’s magazine cartoon art behind to focus on painting and teaching. He became a full professor at Hostos Community College of the City University of New York. He hosted a TV series about art for kids called You’re Part of Art and wrote the acclaimed children’s book about the Guggenheim Museum, I’d Like the Goo-Gen-Heim. Hollingsworth died in 2000, at the age of 72. But his art is still popular among collectors. 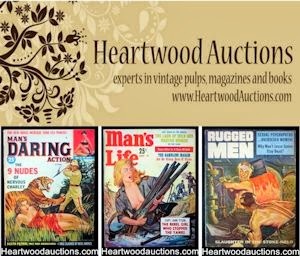 You can usually find some Hollingsworth paintings, prints or original cartoon art on eBay. And, if you’re a comic book fan, you should check out the posts about Hollingsworth on Scott's Classic Comics Corner and the Comic Book Catacombs Website. 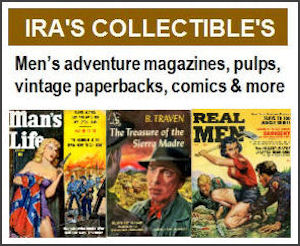 Also be sure should also check out Josh Alan Friedman’s website, where he has posted a series of great articles about men’s adventure magazines. Comments? Questions? Post them on the Men’s Adventure Magazine Facebook Group. A great overview of the art of the Girlie Pulps. 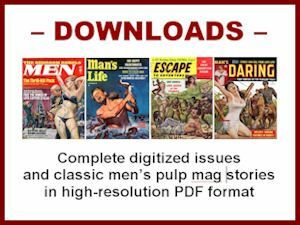 208 full color pages and over 400 cover reproductions.